One of the inhabitants of bluebird nest boxes is not native to the United States. Can you guess which one? You guess it! House sparrows are native to Europe and were brought over in the early 1850s. They are quite competitive over nesting cavities and in a bluebird vs. house sparrow match-off, the sparrow will win almost every time. Which is why monitoring your bluebird boxes is so important. Checking your boxes every week enables you to know who is using your nest box. Sparrow nests (and even the eggs) can be removed to discourage further nesting. Once the house sparrows leave the nest box, it is open for native species to come a-knockin'! House sparrow nests are messy and often fill the nest box. Not the tunnel entrance and cave-like appearance. In case you are unaware, the nests of our native species (bluebirds, tree swallows, chickadees, and wrens) must not be disturbed. They are protected under the Migratory Bird Treaty Act, which prohibits harm to the nests, eggs, and young of migratory species (and the migratory species themselves!). Even from a distance, tree swallows' bright white chests and deep iridescent blue backs are easy to identify. 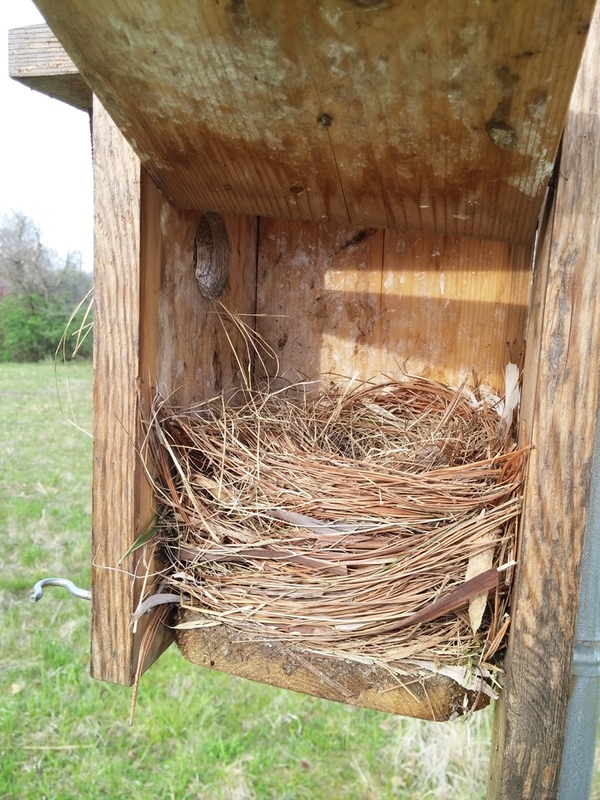 Monitoring your nest boxes not only ensures that bluebirds and other native species have the places they need to reproduce, but it's also fun to do! As long as you are careful, boxes can be checked every week with no harm to the birds. Open the boxes carefully and slowly (I find knocking lightly on the box will alert a nesting adult to briefly leave the box), take a peek as the nest and record if there are any eggs or young. If you must touch the nest or eggs to get an accurate count, don't worry that the scent left by your hand will cause the adult bird to abandon the nest. That may be the case with some mammal species, but not with birds. Tree swallows line their nests with feathers. Before the feathers are added, the nest looks very much like a bluebird nest. With tree swallow nests, you will almost always have to touch the nest in order to see the eggs. Tree swallows build their nests from grass, therefore they start out looking very much like a bluebird's nest (a very neatly woven nest of grasses - see first picture in article), but the finishing touches are large feathers that curve and create a soft canopy bed for the bright white eggs. Tree swallows nest in Ohio from roughly April through the end of July. They are very protective of their nests and will often dive-bomb intruders. Don't worry - the birds don't actually touch you, only buzz the top of your head. Granted this is still enough to cause most nest box monitors to duck out of alarm! After a while, however, you will become accustomed to their impressive aerial defense tactics and learn to respect their fierce parenting skills. This is actually a Carolina wren, another Ohio species. I was unable to find a good picture of a house wren, however this bird is similar in appearance and posture to that of a house wren. House wrens are familiar to many homeowners who have bluebird nest boxes, or nest boxes specifically catered towards house wrens (these typically have a smaller entrance hole). These small little chatter boxes begin nesting later than other bluebird box nesters, around June, and can be seen perched nearby boxes singing happily away with their tiny tails stuck up in the air. Interestingly, this busy wren built its nest right on top of a bluebird nest (grass at bottom) before it could be removed! Though sometimes house wrens will chase bluebirds out of nest boxes, this bluebird nest fledged 4 young birds before the wrens moved in. The nest of a house wren is composed almost entirely of small twigs and sticks that completely or nearly so fill the nest box. Within the cluster of the surprisingly neatly organized twigs, is a small cup-shaped depression lined with grasses, fibers, rootlets, and feathers. House wren eggs are white but so heavily speckled with cinnamon-brown spots they can appear tan in color. An interesting territorial display of house wrens is the construction of 'dummy nests'. A dummy nest is a not-so-neat compiling of sticks and twigs in a nest box. Dummy nests will have an unfinished, haphazard look to them. As with many songbirds, it is the male that scopes out potential nest sites, and not the female. He will establish his territory by building dummy nests in all or most of the nest boxes in an area. The female will then come along and choose an acceptable nest to put the finishing touches too. The other, unused dummy nests remain, however, through the nesting season. This behavior can become a problem in the early part of the nesting season, in June and July, when bluebirds, tree swallows, and chickadees are still nesting. These dummy nests prevent these species from claiming a nest box for themselves. Once a house wren has laid eggs, dummy nests in nearby nest boxes can be removed, freeing them up for other species. Remember, songbirds of the same species will rarely nest close to each other, however they don't seem to mind nesting near another species. This is why bluebird nest boxes are often paired together on a trail. Last but not least, is the chickadee. Ohio is home to two species of chickadees, the black-capped chickadee (found in the northern half of the state) and the Carolina chickadee (found the in the southern half of the state). Both species are cavity nesters and will use bluebird boxes if they are close to a woodland edge. Chickadees, as well as house wrens, are woodland species whereas bluebirds and tree swallows prefer more open spaces. If you are getting more chickadees and house wrens in your bluebird nest boxes than bluebirds and tree swallows, try moving your boxes to a more open area. Chickadees also build nests in bluebird houses. Nests are made of grasses and moss and lined with fur. Chickadees build their nests (starting in March-April) with grasses and mosses, then line them with fur. Where do they get the fur you might ask? Chickadees will search for tufts of fur left behind from a mammal's fur coat or possibly from a rabbit's nest (rabbits also line their nests with fur). On occasion, some very brave chickadees will pluck the fur directly from the source! This behavior is seen more frequently in titmice, another species in the same family (Paridae) as chickadees. Unfortunately, I am still waiting to catch a chickadee or titmouse in the act of plucking fur from a live animal, so until then you will have rely on your web browser of choice to see pictures of this comical act. Indeed, biologists have found a variety of fur in titmice nests - raccoon, opossum, dog, fox squirrel, red squirrel, rabbit, horse, cow, cat, mouse, woodchuck, and even human hair! If you are monitoring bluebird nest boxes, you will know when the young have fledged (left the nest). Once this happens, you can remove the old nest and brush out the nest box. If early it is in the summer season, you will likely get another nest in the box. At the end of the nesting season - end of August into early September - clean out any old nests. In late February, clean them out once again to ready them for returning bluebirds. Sometimes mice will take up residence in a bluebird nest box over the winter. Below is one final picture I took this season - the female bluebird was so busy building her nest, she was oblivious to my presence! Happy nest box monitoring! I am always impressed by a bird's ability to weave such an intricate nest with just their bills!